This Orange Cream Filling Recipe is light and creamy and surprisingly SIMPLE to create. Because it’s made with instant pudding and heavy whipping cream, it has a mousse-like quality and great flavor versatility with the addition of extracts. For a wonderful lemon cream filling, you can use this recipe but add 1 tsp lemon extract rather than orange. For a fabulous chocolate filling, simply eliminate the extracts from this recipe and substitute instant Chocolate Pudding. In fact, you can find a link to our delicious, easy Chocolate Filling recipe here: Easy Chocolate Mousse Filling. We often refer to these fillings as a mock mousse- they have great flavor and the consistency of a mousse filling, but can be made in minutes! 2 c. (464g) heavy cream or whipping cream. Combine the pudding mix and heavy cream and orange extract in a mixing bowl. I prefer to mix with a hand held mixer, but a whisk is just fine too. If using a mixer, start on low speed until well combined. Then, switch to high speed and whip the pudding until thick and fluffy. If mousse is too thick, mix in small amounts of heavy cream to reach desired consistency. If mixing by hand, simply whisk rapidly for a couple of minutes or until mixture is nice and thick. Refrigerate until ready to use. Cakes with this filling should be chilled until close to serving time. 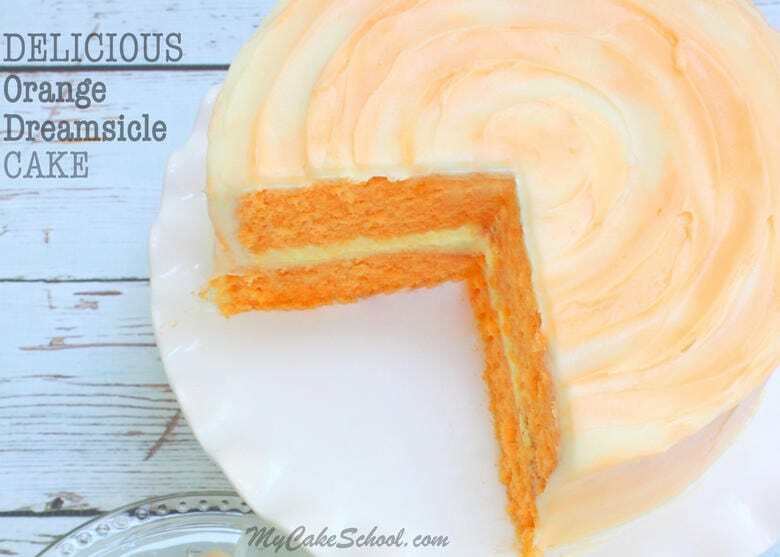 We used this Orange Cream Filling recipe as the filling in our Orange Dreamsicle Cake Recipe and absolutely loved it. We hope that you enjoy it too! Don’t miss our full collection of favorite cakes, frostings, and fillings in our Recipes Section! This sounds heavenly. I’ve tried pudding with Bettercreme also instead of whipping cream and it was good too. Try it with pumpkin spice pudding mix around the holidays …. amazing!!! You are right, it IS like a mock mousse. Thank you so much, Joan!! The pumpkin spice sounds fabulous! I’m making a 2-tier cake (20cm & 25cm) and would like to use the orange dreamsicle cake with this orange cream filling. Are the flavors suitable for children? As the filling has cream, how far in advance can I make the cakes? Will they be stable under fondant? Hi Ruby, I think children will love the flavors in this cake and filling. If you need to bake the cake layers in advance, you can wrap them individually in plastic wrap and aluminum foil and freeze for up to two months. The orange cream filling can be made several days in advance and refrigerated until you need it. It firms up when refrigerated but just leave on the countertop a short while and stir and it will be spreading consistency. The completed cake will need to be refrigerated because of the cream in the filling and the cream cheese frosting (if you plan to use that). If you want to complete the entire cake, you can do so and refrigerate it. We like to serve the cake by the 3rd day. It should hold up well under fondant. What will be under the fondant? The Orange Cream Cheese Frosting that we used on the cake is too soft to use under the fondant. 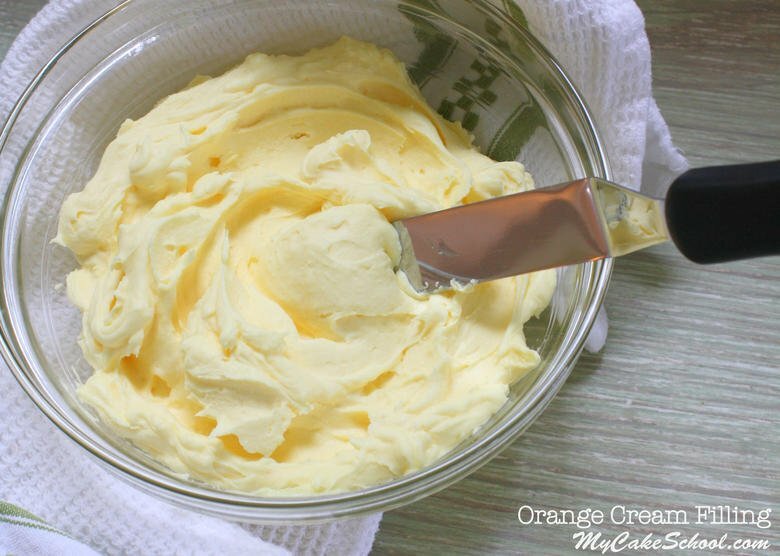 You could use orange extract in you favorite buttercream recipe and use that under fondant. Jodie, I found Jello brand ‘pudding’ on Amazon, am going to try a comparison with Angel Delight/instant whip! Watch this space!!!!! Hi Rachelle, We don’t recommend it as a frosting but it makes a great filling. Have you tried freezing this mousse? @Terra, we’ve never experimented with this. I would worry that it would separate and I’m not sure how easily it could be whipped back to original consistency- let us know if you get it a try! Hi! Sounds delicious. Is this basically an orange cake with orange filling? I think I’m thinking of a creamsicle – orange exterior with vanilla inside. Do you have a recipe for this one? Maybe the orange cake with vanilla pudding filling?